Des Amis literally translates to "friends of the." and the wine completes the thought. The winery is part of ALC/VOL, founded by corporate dropout Greg Ahn and his band of wine crazies who are out to make the wine world a better place. They seem to have accomplished their goal. They now produce seven different wines from major grape-growing areas, including Napa, Sonoma, Monterey and the Central Coast. All have received awards and high scores from the press. Their goal isn't as easy as it sounds. You have to pay attention to every detail of every wine. And then you might have to deal with a disaster like the fires that created havoc in Napa and Sonoma, forcing them to move to Monterey. But, nobody said this would be a picnic. And speaking of picnics, I don't think you could find a better wine for one than our selection. 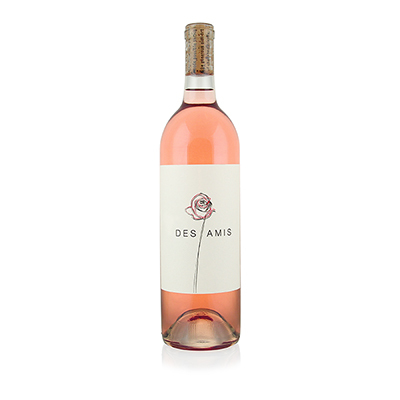 Made primarily from Sonoma Pinot Noir and Central Coast Grenache, our Des Amis is a textbook Rose with flavor and complexity to match any dish you may throw at it. That sensuous, vibrant color draws you into the glass like no other wine can. Then comes the plethora of aromas, from peach and pear, to watermelon, tangerine and orange blossom. The palate holds all the flavors that the nose promised and then some. Now cherry blossom enters the fray to complement all the lovely melon, berry and citrus components to a grand finish. Outstanding.